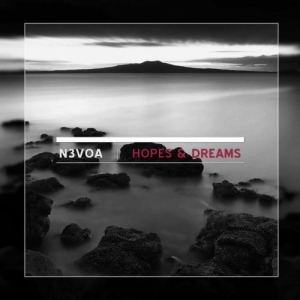 From the moment I opened the packaging and started looking through the lavish booklet detailing photos and lyrics to Hopes & Dreams, I knew from the onset, a dark tone would flow gently into the estuary of N3VOA's message. Fear not the gripping undertow of grief, self-reflection, solitude and despair, for there is hope…… and there are dreams. Behold Diego Bittencourt's labor of love presented in a triple CD documenting the past 2 plus years of words and music through the hard work of N3VOA and all the amazing collaborations that take place on Hopes & Dreams. As we explore the first chapter of Hopes & Dreams a window opens to unveil the first piece of the big picture, which is the genesis of hope. There are many subthemes within the themes that take us into the mind of N3VOA. Most of the lyrics are written by Jonas & Diego Bittencourt as well as few by Claus Larsen focusing on personal conflicts and emotional battles that penetrate the very fabrics of human frailty. Some get overwhelmed with emotion and in time they are gradually released from its chains, while others never recover. In N3VOA's case the dreams seem to be the release from all the emotion built up in each of the subthemes. This is how N3VOA moves on, knowing one's strength to deal with such difficult obstacles that barricades us from moving on with our dreams. Musically, the first disc displays a wealth of creativity. Aside from parts of 'Alone', the tempo never really gets to the point where you want to get up and dance; instead you get a very technical approach where the music and vocals alternate sharing the spotlight in most of songs. Many times the concentration is on the vocals with minimal music accompanying it and other times there are mild anthem build-ups to a point where the song tempo crescendos only to slow down again. You definitely get a feel for early VNV Nation and Assemblage 23 mixed in with some mid 90s Leaether Strip influence. The atmosphere displayed on many of the tracks show great restraint to avoid going for the huge dance floor killer. Diego's music lends itself to go in many directions. With each break and tempo variance N3VOA stays within the preconceived parameters, steering away from the easy route and instead taking the road less traveled where there are no monster dance beats, but rather a steady diet of tempo alterations set to a dark electro chassis that occasionally assimilates some synthpop influences into the mix. All the tracks are solid and worthy of any praise thrown their way. 'Evolution', 'Alone' and 'Change Is Yet To Come (Featuring Claus Larsen)' stand out as the most diverse of the eight tracks. 'Rude Awakening', 'Metamorphosis', 'Putrid Nature', 'Seek & Destroy' and 'Controlled Sanity' are all well designed complex and thoughtfully layered dark electro tracks and typically fall into the same vocal style. One aspect that really stands out on 'Putrid Nature' is opening drum pieces, perhaps a nod to Diego's earlier years as a drummer. The music and vocals move into exploratory levels where Diego's voice is more refined than what we hear on the previous eight tracks. Disc 1 was very whispery and melodically dark in nature, whereas on Disc 2 the vocals are generally cleaner with much more range and have a more polished approach lending more concentrated emphasis on the melody. Musically, there is so much to be impressed with. Clever and distinct sounds creep in the background and even more forge their way to take center stage in the composition. The next chapter opens with 'Hopes & Dreams' which features Tom Shear's voice on the chorus. I feel as if I awoke nearly twenty years in the past and found a lost recording of early Assemblage 23. Clean vocals throughout and lyrics that preach the message of overcoming the obstacles to chase your hopes and dreams. This seems to be the rally cry of the entire Hopes &Dreams release. Great examples of N3VOA exploring sound to diversify his approach can be found in 'Unequivocal Ignorance' and 'Ultramarine'. Both utilize some vocoder treatments to Diego’s voice along some killer synth pieces sure to lure the listener closer to the inner sanctum where the dreams are born. While Tom Shear helped with the chorus on the track 'Hopes & Dreams', Claus Larsen lends his vocal talents to 'Breathing'. The intrigue factor intensifies with every track on this second disc. The final eleven tunes make up the closing chapter. All of the remixes are done by some of the most well known names in electronic music. Daniel Myer participated as a producer in 'Rude Awakening' as well as on 'Prose Of Death'. He also had his way with 'Evolution' taking it to a more polished level than its original form. As much as I like the original, the remix explores a more dance friendly version much like many of the standout remixes housed on this final disc. The Brazilian act Aesthetische delivers a punishing electrosmasher remix of 'Alone' littering the floor with BPMs and swollen basslines. Assemblage 23 is no stranger to working with N3VOA. We heard Tom's voice in the chorus to 'Hopes & Dreams'. The remix has the same feel as the original with a faster pace to the beat and some well-placed enhancements to the sound. Leaether Strip remixes 'Seek & Destroy' and 'Rage'. Both have the Leaether Strip vibe but the 'Seek & Destroy' remix takes the prize with a vicious straight forward stomper. I haven't paid much attention to Claus' comeback, but it's nice to hear remixes like this. Cheers to Claus! The Signal Operator keeps pace with the aggression of the Leaether Strip mixes. Jarkko Tuohimaa of Neuroactive delivers a stellar club version of 'Stand By You' to go along with his production credits for several tracks on Hopes & Dreams. Amorphous gets crafty and delivers a masterful manipulation of 'Metamorphasis'. If anyone is envious of the assemblage of talent attached to Hopes & Dreams it only gets more gluttonous with Patrick Codneys of Front 242, Decoded Feedback and Mind In A Box all dedicating some quality alterations to N3VOA’s music. Mind In A Box is probably my favorite remix. It’s infested with everything that makes MIAB so diverse. Mind In A Box creates an amazing rendition of 'Broken Promises'. The song is simply stunning, but the downside is, that it erases away so much of N3VOA you many not even recognize it as N3VOA. A lot of time was devoted to releasing Hopes & Dreams. With all the producers and remixers to the artwork and packaging, Diego and company put out one hell of an effort. You can preview this release and others on N3VOA’s Bandcamp page. You will not be disappointed. Thumbs up! Experimental Metal Band That Dam Fly Releases New Music Video "Ham Steak"